So let’s get the story correct. We are still in the midst of a credit collapse where there is simply too much debt and debt service globally relative to worldwide income. The fact that we had a year-long respite does not alter this view. It was a respite that was induced by what is now an apparent unsustainable pace of bailout and fiscal stimulus in practically every country on the planet, not just the United States. What has happened was that governments bailed out the banks and massively stimulated the economy but because the revenue cupboard was bare, in part due to the savage effects of the global recession, public sector debt loads exploded at all levels of government, and to varying degrees, in every jurisdiction. 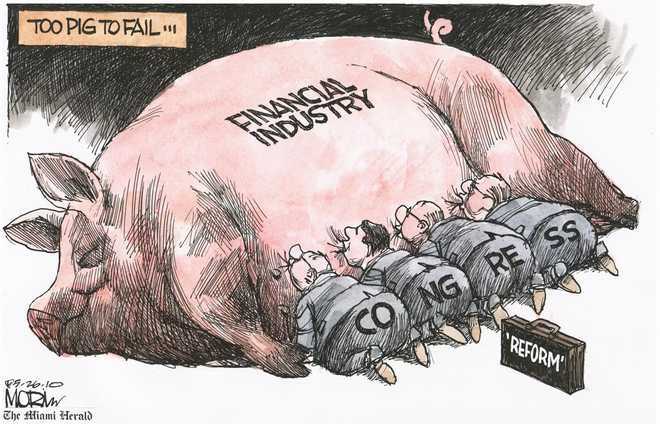 Not only that, but because of global bank capital rules, these financial institutions were not compelled to put any new capital into reserve against these government bonds because of their investment-grade status from the ratings agencies, when in fact, very few countries actually deserve the ratings they have when one assesses structural deficit ratios, debt/GDP ratios and interest costs/revenue ratios appropriately. Now, ironically, the governments, having saved the banks, only to then rely on the banks to fund their bloated deficits, are now in a situation where their banks need help again because of the eroding quality of the government debt on these bank balance sheets. Talk about a dangerous game of musical chairs. A sad, brilliant, devastating commentary on American democracy at work by Michael Lewis (ht: Dr. Vidyasagar) in the form of a letter from a financial sector lobbyist to his clients. Vintage Michael Lewis, of course. To this one-item reading list must be added this short piece from Gretchen Morgenson which talks of negligible progress after 3000 pages whereas Glass-Steagall took all of 34 pages. A compelling alternative premise, one that I personally believe is most likely to emerge as the consensus assessment among future scholars, is that the incentives created by the financial safety net were the chief cause of the financial crisis. future assessments of the official response to the financial crisis will hinge less on the TARP and the large-scale market interventions by the Fed that followed AIG, and more on how the sequence of actions in the year before might have discouraged critical actions that firms could have taken to protect against financial distress. While regulators have a fairly good record of preventing exact replicas of past crises, it is another matter entirely to foresee the distress that might result from the confluence of innovative financial arrangements and shocks to unanticipated macroeconomic fundamentals. If, in a crisis, regulators remain focused on alleviating ex post distress, they are likely to err on the side of rescue and further weaken market discipline. The expansion of the implicit safety net has been driven by the pursuit of ex post efficiency — that is, doing whatever it takes to alleviate the adverse impact of financial distress once it has occurred.11 Future economists may continue to debate whether official interventions in this crisis have achieved significant ex post efficiency gains, but our true goal ought to be ex ante efficiency, not ex post efficiency. we will not break the cycle of regulation, by-pass, crisis and rescue until we are willing to clarify the limits to government support, and incur the short-term costs of confirming those limits, in the interest of building a stronger and durable foundation for our financial system. Measured against this gauge, my early assessment is that progress thus far has been negligible. Professor Ross Levine calls the financial crisis in the US a case of ‘negligent homicide’. The steps that eventually led to the homicide have been well documented elsewhere and on this blog too. But, nonetheless, it is good to keep the words of a Brown University Economics Professor handy. What are the institutional underpinnings? I am not so sure that what needs addressing are institutional underpinnings as much as individual and behavioural underpinnings. Second, belief that risk is not so important because business cycles have been moderated. Therefore, only lip-service and ‘powerpoint service’ were paid to risk management by one and all. Regulators knew it but they thought it did not matter. Third, mistaken belief that competition and more firms meant dispersion of risk. They failed to reckon with dispersion of returns rather than risk as more firms adopt same practices, own, buy and sell the same financial products. Fourth, US monetary policy that pulled all others’ rates down in a race to the bottom in 2001-2003, flooded the world with easy money, altered incentives for savings and for borrowings and facilitated easy leverage and leverage-based products (aka ‘financial innovation’). What could European leaders possibly find more arrogant than to be lectured on bailout policy – not simply by the U.S., but specifically by a one-trick pony bureaucrat whose chief trick is the ability to smoothly talk the language of prudence while simultaneously pillaging the fiscal stability of an entire nation for the benefit of bondholders who made bad loans? While we are at it, it might make sense to take note of the article on ten most corrupt contemporary Americans (ht: Barry Ritholtz). When I shared this with a few friends, one of them asked why the list was not 11. Guess whom he had in mind. John Plender says that the US looks a lot better than Europe (true for now and perhaps, true on the dimensions he looks into) and hence US dollar share of global reserves would rise again. He may be right. Or, the share of Gold and Swiss franc might rise faster than that of US dollar even as EUR share falls at least as it stands currently. The prospect of a split looks less unlikely (sorry for the double negative) than it did before. FT Alphaville covered the escape clauses lenders gave themselves in proposing a financial assistance package for Southern European countries. For the most part, financial markets ignored it. But, we are not sure if Southern European countries would be able to ignore it, eventually. The German Parliament might have approved Germany’s participation in the lending programme but many observers say that German public remained rather displeased. The German Constitutional Court holds the key now that the French have clearly said that they had broken the EU Treaty in coming up with the financial assistance package. Martin Feldstein says rather quietly that the Eurozone would survive the current crisis but not all of its current members would remain as members a year from now! Is that survival? The good thing about George Magnus’ piece is that he at least tries to sketch what might help to avoid the grim forecast of, say, Martin Feldstein above. He calls for political imagination that would break the market’s worry over debt restructuring in the southern European countries and the chance of a breakup of the Euro into two halves or many parts. Among other things, he calls for economic and financial reforms in the Eurozone. One such reform is dealing with bad debts in German and French banks. Wolfgang Muenchau in FT is not so sanguine about it. He thinks that the Southern European debt in the Northern European banks is of the same quality as the AAA and AA rated tranches of CDOs of Sub-Prime RMBS. We all know what happened to their valuations subsequently. If so, holders of these debts have to worry now. They would start selling or should start selling. The European Central Bank has to keep buying them. Its balance-sheet would swell and the EURO would keep getting weaker. That might be a positive. All hopes rest on the weak Euro delivering strong export and overall growth to Northern Europe, muting their criticism and enabling southern Europe to undertake austerity measures without causing social disruptions. If you believe that this outcome carries a higher probability than the one of either Southern debt restructuring or Eurozone split or a banking crisis in Germany and France or a bit of all of this, then you should be buying European assets on dips. [Update: this blog has noted Mr. Lorenzo Smaghi’s comments approvingly in recent times. However, intellectual honesty demands that this brilliant counterpoint by FT Alphaville be acknowledged. This is on the same lines of the comments of Kapil Dalal to my post on capital controls in Europe]. The regional sales head for CLSA Damien Kastel prepares an interesting publication called ‘Bits & Pieces’ which is a collection of interesting observations made by several commentators – within CLSA and without. He has his own comments on them. They are hand-written and that lends a personal touch to the comments. One of the comments he had picked up was from the PIMCO Annual Secular forum report by their co-CIO Mohammed-El-Erian. You can find it here. It is a world where the safest of carry will come from duration and curve in sovereigns that, due to their economic and financial fundamentals, are truly core countries in the midst of this global paradigm shift. Clients should liaise with their managers to set a “realistic” real return target (recognizing that available returns are a function of the opportunity set, not a function of the needs of the fund). After all, the aim of investing must surely be “maximum real returns after tax” as Sir John Templeton observed long ago. None but a few very lucky fund managers get to retire on relative performance. Having defined the target, managers should be given as much discretion as possible to deliver that real return. This avoids the benchmark-hugging behavior that is typically induced by policy portfolios. Thus, an approach that combines a more sensible view of risk and a concern for valuation makes considerably more sense to me. Having been in this industry for some time, let me simply state that this does not appear imminent. His observation on why volatility is not a good measure of risk is well-made. Volatility indices were extremely low in 2007 and they were extremely high post-Lehman Brothers bankruptcy in 2008. Which of the two periods were the riskiest for investors? – buying in 2007 or buying in 2008, post-Lehman? The world is on a journey to an unstable destination, through unfamiliar territory, on an uneven road and, critically, having already used its spare tire(s). There were four speakers: Arminio Fraga, Ian Goldin, Greg Ip and Kenneth Rogoff. My money is on Ken Rogoff to have made that colourful statement. Yours? A friend had forwarded this to me. I am very sure that this article would be forwarded and circulated a lot. Martin Wolf has used the ants and grasshoppers framework to describe the decisions and choices made by Asian nations – including China and Japan – to lend to America and by Germany to other European countries. Very well-written. In his story, ants lose their savings, eventually. Whether in full or partially is not made clear by Martin Wolf. Perhaps, that is the end-game for the chain of events unleashed by the crisis that originated in America’s sub-prime mortgage sector. In Martin’s tale, some ants starve to death because they do not get back what they had lent to the grasshoppers. How would they react to that prospect? Wars, any one? Second, if this is the end-game and if it has a reasonable probability, should ants continue to lend to the grasshoppers or stop accumulating reserves to be lent to grasshoppers? Are the ants doing that? Not yet. What are the ants waiting for? Perhaps, they were waiting precisely for a column like this to goad them into action. Bibek Debroy assigns a score of 1.6/10 to the UPA II’s first year based on the specific promises made and fulfilled in the first one year. The government made some specific commitments for the first 100 days .They have apparently delivered on 4 out of the 25 commitments made. As is the case usually, it is a well-written piece. The only thing that is disappointing about this piece is the last paragraph. Perhaps, it is too tongue-in-cheek. Other than this, what I liked abut this piece was Bibek’s reference to the fact that contemplating the potential of the counterfactual scenario of higher growth with more refoms is an impossible task for the public and for politicians. Well, it is a very difficult task for most humans in most situations. Evaluating a particular course of action/recommendation for its intrinsic merit, costs and consequences should always be done in the light of the alternatives foregone and what they would have entailed in each of these dimensions. IT is easy to praise or to criticize what one sees. It is a lot harder to place such evaluation in the light of the alternative choices forsaken. That is why we repeat errors and that is why we are only occasionally and accidentally rational. While you are at it, you might also wish to check out Niranjan’s comment on the tale of two Manmohan Singhs . Niranjan is a lot more restrained than he could be. What could have been done with all the monies spent on the redistributive programmes of the last six years boggles the mind. Who said that India really reformed and that they were irreversible? Mr. Manmohan Singh has reversed himself and that is what Niranjan hints at.